A course record could be set. A runner could slip at the finish line. A nail-biting finish could happen. A world record could be broken. A World Marathon Major title could be nearly clinched. A personal best--not just among the regulars but the elites--could be achieved. So three of those didn't happen at Sunday's race. But a lot can happen while you're running the marathon at your pace--fast, slow or somewhere in the middle--and the elites are tackling the 26.2 miles at their blistering speeds. The race could be turned into a fun run of sorts--2007's scorcher of an October Sunday where race organizers halted the race and runners were either bussed back to Grant Park or asked to walk as opposed to run in the intense heat. Among the elites, the difference between first and second place could be determined in the final 200 meters on Columbus. Or Chicago's flat and fast course could make for a world record run--Khalid Khannouchi in 1999 and Paula Radcliffe in 2002. Or it could be a race with a photo finish. The problem with running the marathon is that you have no clue what's happening among the elite field, the portion of the race that's getting almost all of the news coverage. Who dropped out? Who's leading the field or about to make a move or going to get dropped? Who won? What were the fastest times? 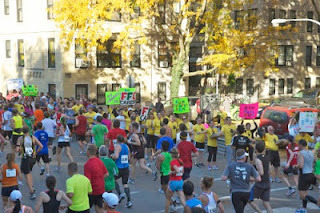 What's it like to watch them, and all of the runners for that matter, run by? I'm always running the marathon--Sunday marked my 13th--so I have no clue what it's like to watch the elites tackle the streets of Chicago. They're starting when I'm still sitting on the ground in my start corral working on a Sudoku puzzle, and they're finishing when I'm running through the West Loop (if I'm lucky). That can only leave me asking one question: What happened at the 35th running of the Chicago Marathon while I was running? For starters, 37,455 participants crossed the finish line, an event record. No wonder it felt so crowded on the course! I guess no one was going to bail on the start time temperature of 42 degrees and light winds. A little chilly yet ideal for running 26.2 miles, but perfect for crushing some records, personal and course. It was Tsegaye Kebede of Ethiopia who crossed the finish line first in 2:04:38, breaking the course record set last year by Moses Mosop by nearly a minute. His win was the first by an Ethiopian male in the Chicago Marathon, and he was joined by fellow countrymen Feyisa Lilesa (2:04:52) and Tilahun Regassa (2:05:27) atop the podium for an Ethiopian sweep. Wesley Korir, who was the runner-up last year, bettered his time (2:06:13 vs. 2:06:15) but ended up in fifth among this fast field. Dathan Ritzenhein was the top U.S. finisher with ninth place, but more importantly, the Michigan native who said that he had always wanted to run this race bettered his personal best by more than two minutes. His 2:07:47 makes him the third fastest American of all time (I need to do more research but I'm guessing that the others are Ryan Hall and Khalid Khannouchi, who ran Chicago both before and after becoming an American citizen). As for the women, Liliya Shobukhova of Russia was shooting for her fourth consecutive win in Chicago. But she was stopped in her tracks by the closet women's finish in race history. The top four women finished under 2:23, and Shobukhova was left off the podium with a fourth place 2:22:59. Atsede Baysa of Ethiopia nudged ahead to grab the win over Rita Jeptoo of Kenya by one second. But what seemed more stunning about the win was that Baysa was trailing the leaders at 30K and then caught the pack by 35K. And then it became a battle between her, Jeptoo and Lucy Kabuu who would eventually in third. Baysa's 2:22:03 was a personal best, as was Jeptoo's 2:22:04, and Kabuu clocked a 2:22:41. The top U.S. finisher was Renee Metivier Baillie, the Oregonian who was running her debut marathon; her 2:27:17 was good for eighth place. But the finish line was far from quiet before the elites crossed it. In the wheelchair race, Tatyana McFadden of Champaign, Ill., defended her title and won by more than six minutes in 1:49:52. Josh Cassidy of Canada took the win on the men's side, besting Champaign's Adam Bleakney, 1:32:58 to 1:34:23. And the fourth annual Nike Northside/Southside Challenge pits the area's top high school cross-country runners against one another for a race on the final 2.62 miles of the marathon course. By my calculations that means they started just before the Nike mile 24 on Michigan Avenue. Pat McMahon of Carl Sandburg High School finished first for the boys in 13:07, and Carly Krull, also of Sandburg High School, finished first for the girls in 15:18. But their wins weren't enough for the Southside to take home the team competition, that title went to the Northside squad. Enough with me rattling off the results, I have a race report to write. Did you run this year's Chicago Marathon? How'd you do?